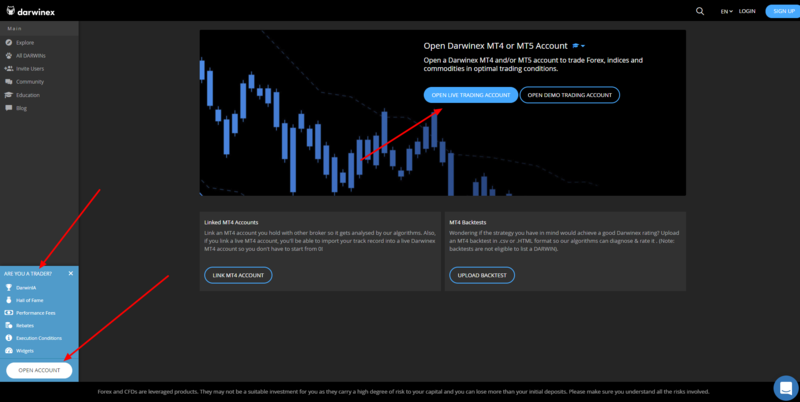 Once your Darwinex account is verified, you'll be able to open several live Metatrader trading accounts, a live investor account, and create DARWINs on top of your live trading accounts. A Darwinex account is associated to a public username that cannot be changed. Be careful when choosing your username! A Darwinex account can be held in only one currency which then needs to be the currency of all trading accounts opened from this Darwinex account and must also be the currency of the investor account. The account currency cannot be changed. Darwinex accounts may be EUR, GBP or USD denominated. The minimum first deposit for individual / joint accounts is 500 EUR, GBP or USD while the minimum first deposit for corporate accounts is 10 000 EUR, GBP or USD. 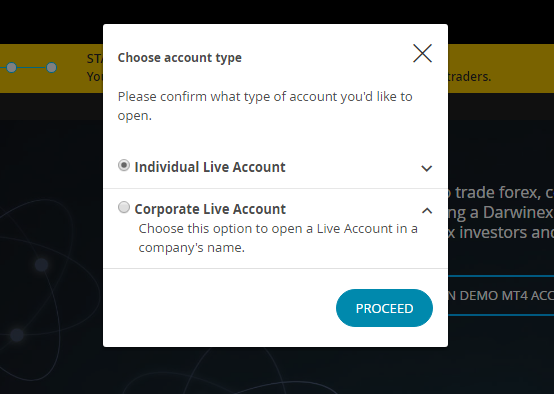 You can start the verification process by clicking on "Open live account". Please note that once an account gets verified, it is not possible to change the owner of the account, nor is it possible to transform an individual account into a joint or a corporate account. Individuals opening a joint Darwinex account must also have a joint bank account for depositing and withdrawing monies. For opening a joint account, please choose "Individual account" when asked to select your account type. 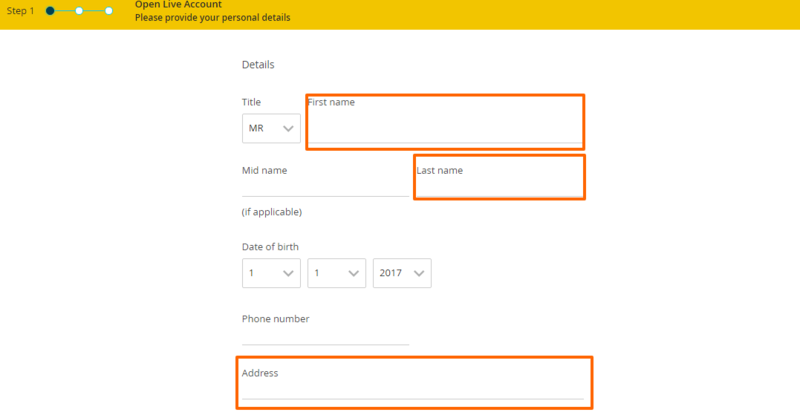 Afterwards, please introduce the name and address of both account holders in the Name, Surname and Address fields. When asked to upload documents, please upload the documents of both account holders. In the last steps of the verification process, you'll be asked to upload the following documents through a secure system. We need a valid copy of the Passport / ID / driving license of the account owner(s) (please make sure you provide the backside in case of ID and driving license). A valid proof of residence (e.g. bank statement, utility bill, etc.) less than 3 months old so we can verify the current address of the account owner(s). *Spanish residents must also provide the CNMV declaration (downloadable from the user’s own profile) duly signed. **British citizens must also provide a document to verify their UK National Insurance number. Afghanistan, American Samoa, Bahrain, Barbados, Belarus, Benin, Bolivia, Bosnia & Herzegovina, Burkina Faso, Burundi, Cambodia, Cape Verde, Central African Republic, Congo (Zaire), Cote D'ivoire (Ivory Coast), Democratic Republic of Congo, Egypt, Eritrea, Ethiopia, Grenada, Guam, Guinea, Guinea-Bissau, Haiti, Iran, Iraq, Japan, Kenya, Laos, Lebanon, Lesotho, Liberia, Libya, Macao, Mali, Maldives, Marshall Islands, Mongolia, Mozambique, Myanmar/Burma, Namibia, Nepal, Niger, North Korea (Democratic People’s Republic of Korea), Northern Mariana Islands, Pakistan, Palau, Palestine, Panama, Paraguay, Puerto Rico, Saint Lucia, Samoa, Sao Tome And Principe, Serbia, Sierra Leone, Somalia, South Sudan, Sri Lanka, Sudan, Syria, Tajikistan, Tanzania, Trinidad and Tobago, Tunisia, Uganda, US Virgin Islands, USA, Vanuatu, Venezuela, Yemen, Zambia, Zimbabwe.